What is REAL live rock??? What you see in your stores being sold as 'live rock' is a misnomer, as being alive at one time the name carries on to the ultimate end user eventually. The rock available to the LFS and hobbyists is 99.99% what is called boat rock....or air freighted rock from out of the country. While this rock was alive, fresh and non smelling at one time it simply cannot survive the journey it takes from overseas to the wholesalers and eventually your tanks as it is shipped in a dry condition...or wrapped in wet newspaper. You simply cannot expect much to make it alive after being out of the water a week...or sometimes months in transit to the states. Would be like asking you to go sit on the moon for a week, you would not smell or look very good and certainly not be alive after that treatment. "Live rock" that is treated that way has a better definition, and is where the word "curing" came about in our industry......better description would be "bringing dead rock back to life", or curing that folks are used to. The problems that folks associate with imported 'live rock' are as a result of the rock and the organisms that inhabit it being dead thus acting as fertilizer to your tank. All the problems associated with 'live rock' are usually a result of the rock being in such sad shape the the tank suffers much, which is why you read so much on the internet about the smelly rock folks receive and the need to "cure" it before they can ever consider getting their tanks into shape for organisms. The opposite is true for real live rock that is harvested and delivered to the consumer correctly. There are no issues with ammonia as there is nothing dead/dying to produce ammonia and pollute your tank. Real live rock is harvested from the ocean, kept underwater from harvest to delivery and results in painless easy cycle for your tank. 99.9% of the folks I sell live rock/sand/critters to that are starting new tanks go from an empty tank to full blown reef tank in ten days, no 'curing' no issues, because the live rock/sand is just that, truly alive and happy from the get go. If you talk to the folks that actually have real live rock handled correctly from point of origin to their tanks you will find that there are no issues, they have an easy and painless tank from the get go....unfortunately there is so much information written about how "live rock" has to be cured in a garbage can for weeks before use because almost all the rock that is available in the industry is simply not harvested/kept/shipped correctly, so all you hear is about the horror stories of imported live rock as it has a 99% market share in the industry. "Hi! I'm very excited that I found your website, I only wish I found it a week earlier because I just purchased 40lbs of "live rock" from another Tampa based rock company and can I just say I think I got ripped off. First of all it didn't say anywhere on the website how the rock was shipped and since I'm new to the saltwater hobby I had no idea what I should be looking for as far as how it is shipped. I just assumed that since it was live rock it would be sent in water. But that was not the case. It was sent through two day fedex wrapped in damp newspaper so of course everything that was alive before it was shipped was definitely dead when it arrived to my house, the only hitchhikers to survive were a few tiny bad anemones. And the smell that came from those bags and boxes was horrifying. I gagged a few times and I'm a vet tech so I deal with poop and blood and vomit all day but that smell was rank. The pictures of the rock on the website were beautiful and it looked decent when it got to me but now that it's in my 65 gal tank everything is dying even more and my ammonia is off the chart high. Anyway, long story short I learned my lesson and will absolutely be buying the rest of my sand/Rock/cleanup package from you." Unfortunately this is what is experienced when buying imported/handled incorrectly 'live rock'. The alternative is REAL live rock that is harvested/held/shipped under water to you the end user. 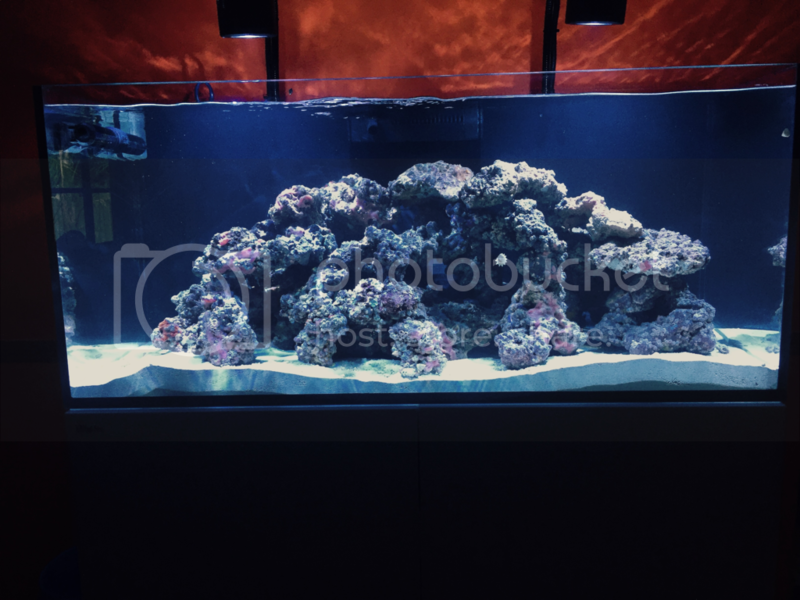 If you are starting a tank makes since to start correctly and not go through the pain and aggravation of dealing with the hassle of curing/waiting for the rock to come back to life, before you can start your tank. You hear all the story's about 'hitch hikers' on REAL live rock, aka rock shipped underwater, and yes there are many....but that is to be expected as you are taking their condos from the ocean and putting them in your tank. If you don't want to take the time to remove anything you don't like....then starting a tank with real live rock resulting in a happy tank in a week, real live rock is not for you. Personally if I see something that is suspect, I reach in the tank and remove it and it gets a new zip code...not that difficult when the critters are confined to your glass box. Talk to the folks who have actually started with real live rock and you will hear the facts...talk to the folks that have never held a piece of real live rock, and you will hear what is written on the internet. This rock below was put in the tank three days ago.....no ammonia spike, no problems no hassle as it is real live rock, and if it were me I would rather start out with life in my tank and a painless start rather than the alternative, but to each his own, I though you might be interested in the realities of "live rock"
I am always amused with the debates, the fear, the gossip and all that keep going round and round. Richard; when I needed help moving my tank I hired a local "Aquarium Maint" crew as they had the pneumatic lifts and knew about moving and setting up tanks.... the company owner was as bad as the rest of the folks with "You will have problems like ...." and he lives here! I have always found it amazing how many folks are just afraid to even try out your rock, it's sad! "inquiring minds want to know..."
All I know is that my tank has been set up with the TBS rock and sand for 4 1/2 days and it looks as though it has been set up for years! Unbelievable amount of life in it! I wouldn't use any other "live rock" that is sold out there. "I want patience and I want it now!" I can attest to what Richard is saying. I've been in the saltwater aquarium hobby for 30 years and I've never had such an easy set up until I used real live rock. I've set up many tanks using both the "uncured" live rock and with dry rock but all have had long break-in periods. I'm a true believer now in the TBS rock and live sand combination. And to that end..happy to tell you I have another 20,000 pounds of Walts 2.1 rock on the way from Fiji...and will be putting it out on the aquaculture site in the coming months! yeah we just need to find a way to make a few clones of you Richard so that you can run a crew of say 10 Richards to do all the diving needed to do this at scale..... Hmmm.... we just need that insta-clone machine.... LOL!